Stephen Lapthisophon, Eggbell, 2016. Mixed media, dimensions variable. Installation view, Sector 2337, Chicago. Photo by Clare Britt. 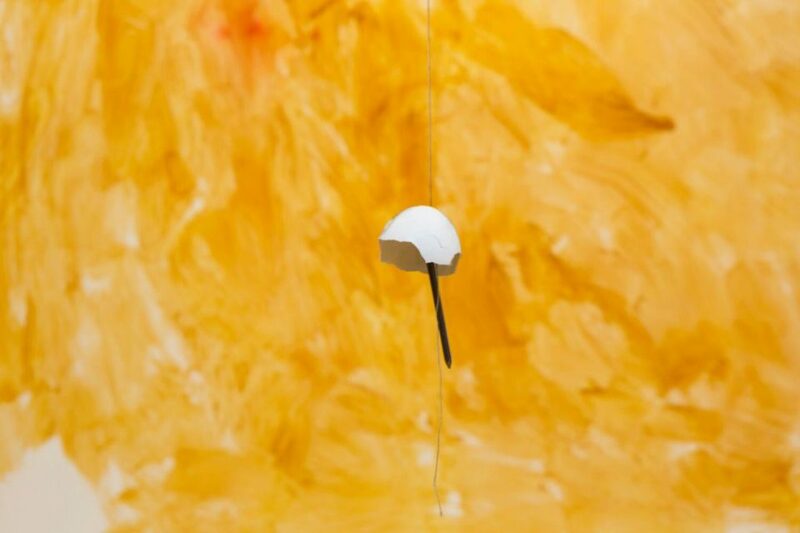 Stephen Lapthisophon’s Eggbell (2016) is true to its name: literally, the top cap of an eggshell sprinkled with gold metallic pigment, weighted by a thick nail, and strung with fishing line from a larger rope. This larger rope is tied to track lighting in the gallery and slopes to the floor, ending under a well-worn hardcover book as thick as my fist. The book is unmarked, falling apart, and, maybe because it seems so perfectly book-like I never considered its contents until someone, inferring from the distinctness of its proportions, recognized it as a dictionary. I mention the book to illustrate something that Lapthisophon does all the time: himself legally blind, he makes work that for various and often physical reasons is not wholly accessible to viewers. In Mumbling (2016), for example, he produced a single painting down the long wall of Sector 2337’s gallery corridor. Although two people can walk comfortably abreast in the passage, it is nevertheless impossible to step back far enough and see the entire composition at once. As such, the combined effect of the preexisting architecture and the painting’s length inflicts an embodied sense of limitation. It would be odd to say that the work actively withholds itself, yet it provokes a frustrating desire to know the work more and differently; in looking, I want the painting to lay itself bare with an unconditional—and perhaps unearned—intimacy that I had not previously realized I expected of the world at large. Here we tend to think of meaning as something foreign, something that can be isolated from, selected, secreted from its container and then keep [sic] in a special place—a cell, or camp, possibly even a jar. Meaning becomes a substance extruded from its holder; something that cannot be squeezed back into matter no matter how hard one tries. Meaning is produced (cast out into the world) the way sheets of paper are expelled from their source, a printing device or some other inscriber of text. Numbers regularly appear in Lapthisophon’s work. This same wall painting includes 1989 and 1913 scrawled in a loose black ink brush. These dates appear within a longer line of seemingly less definitive letters and marks—a lower case g perhaps, a splash of ink, more numbers that stream along with less evident coherence. The marks impose a sense of amnesia for we cannot help but puzzle over their indication towards counting, in this case locking into the convention of time’s notation even as we remain dislocated from their specific meaning. 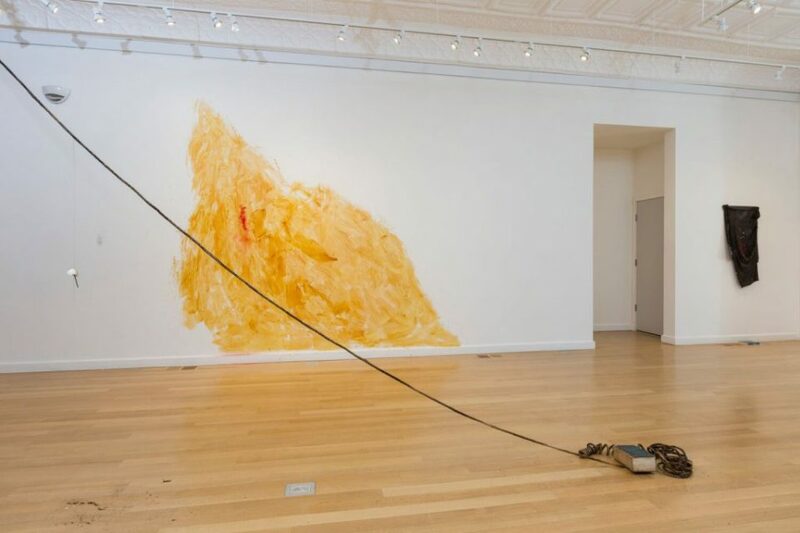 Because his marks and objects in the gallery have an aura of familiarity, one has a sense of reaching for an elusive—yes, fugitive—meaning, only to see instead how accessibility is mistakenly presupposed. How the architecture upon which we hang significance is typically so common as to be taken for granted—is that really a g? The rise and run of a staircase is so habitual as to disappear until the tread is not where one’s foot expects it. The stability of our worldview quakes a little: the cartoon coyote running off a cliff and blinking before it begins to fall. The preceding passage appears three times in Lapthisophon’s book, as though he is rewriting the words in order to reinvigorate a kind of embodied understanding—to see by making, or writing. Instead of remembering, or reading, he rewrites. Is it enough, therefore, that the anonymous dictionary lies on the ground unread but nevertheless present? Another book also appears in the gallery: a copy of Amiri Baraka’s Blues People, published under his earlier name LeRoi Jones, lies in a discrete corner. This vintage paperback sits on the floor against the wall, beneath a torn and paint-ridden black scrap of the t-shirt that Lapthisophon allegedly wore when working. It covers a thick piece of black paper and we see some of the artist’s marks underneath, peeking from the bottom left-hand corner, suggesting that something more lies beneath. Indeed, while not exposed to the viewer, Lapthisophon installed the torn page of a book by the Italian poet-philosopher, Giacomo Leopardi, reflecting on the idea of blackness. Just as we assume that the world allows some degree of legibility, so too we presume that the draped work shirt covering the painting is as much a part of the real object as it is a veil of obfuscation. Lapthisophon draws a connection between Baraka’s study of African American music and colonial European views of nation and race. Yet the connection is obscure and complex even if the two cannot be extricated. Similarly, we must assume Lapthisophon is writing meaningful notes upon the wall, although we cannot know their significance. Or do we? Where does that fugitive feeling come from? Is it the effect of a real absence? Or simply a necessary faith? “Facing the breaking point of meaning, the poet resists falling into the despair of meaninglessness” (N, 91). Mumbling’s “1913” quotation glows a little in the mind, as both the single most important year for European modernism and a moment before two World Wars. Linking up with the exhibition’s title, Style of Radical Will (Italian Sculpture), the date ties the installation to Europe, recalling an aesthetic moment before the eruption of violence—a time before the trauma that we now cannot imagine living without. “The world of 1913 risks becoming viewed as nothing more than an antechamber to the Great War, rather than being looked at on its terms—‘as it really was.’… Of course, it is not possible to escape hindsight.” But Lapthisophon also focuses our attention more specifically on Italy and, in particular, the Arte Povera movement. Coined by critic and curator Germano Celant in 1967, the term refers to a loose group of artists working in the late 1960s and the 1970s who passed over traditional high-art materials such as bronze or canvas and oil as a deliberately political gesture. Instead they aimed to uncover a latent poetic potential within everyday objects, and further to make art disarmingly humble. It was a rebuke not only to the Futurists, resisting additionally pervasive Modernist strategies, but also to their own Renaissance history, liberating themselves from the authority of the past. Lapthisophon quotes these artists and their methodologies so directly as to behave like a Duchampian cover band. In some cases, an artist is directly inserted—as with the red slide projected onto a stack of white boxes containing (but not revealing) Italian glasses. White, sans seraph text says “colore.” The slide itself is an original work by Giovanni Anselmo, on loan from the Nasher Art Center and installed in the gallery within a floor assemblage of boxes, slide projector, a looping orange extension cord, and a roll of bright orange duct tape. In other cases, this quotation is simply the methodology at work: a collection of potatoes piled on an upturned and small cardboard box that says “Trilingual,” or the vase of sunflowers that slowly rot, dropping their petals like dried yellow apostrophes. It is as if Lapthisophon is taking art historical modes and objects along with vases made by other contemporary artists and books that have been read by others as readymades or pop songs that resonate at equivalent frequencies, yielding to the artist like recyclable materials. Each thing both contains and withholds something of its original context, so that it cannot be re-experienced or remembered exactly as it was. Lapthisophon’s writing adopts similar principles of copying. In some cases the original author is quoted directly (Marx, Lewis Carroll, and Paul de Man, for example); in others you can tell it is Lapthisophon’s voice we are reading—as with the story of how he mailed potatoes to a museum curator, or how “In 1968 [he] began an engagement with a kind of art through travel, books, and the influence of [his] mother” while working on a political campaign in Mexico (N, 39). “Many of these works were ‘political’ having been made during revolutionary times or created by artists fully engaged with and committed to progressive causes” (N, 39). At the bottom of the page, he admits a conflation in hindsight: “Unknown to me across the ocean some of the first exhibitions thought of as Arte Povera were taking place in Italy. Now almost fifty years later I find it difficult to untangle the strands woven together that make up my art and thinking: Diego Rivera and David Siqeros, John Carlos and Tommie Smith, Gene McCarthy and my grandfather, Guiseppe Penone and me” (N, 39). In still other places, the writing style leaps out as that which belongs to another author, perhaps even one you have read before but cannot place. For instance: “Historical tradition gave rise to the French peasants’ belief in the miracle that a man named Napoleon would bring all the glory back to them” (N, 48). In these ways, Lapthisophon plays with ideas of authorship and authenticity, exercising the sense that nothing new can be made: we are the accumulations of influence, and yet even in the effort of reproduction some difference occurs that transposes the pulse of an original object into a new, ephemeral now. I fell in love with the eggbell. It had the strange ability to disappear, hanging mid-air, in the middle of the room, under the arc of the rope, just below eye level, the eggshell itself so thin and hanging like a skirt over the nail. I met with classes to discuss the exhibition; we sat in a circle around the rope and dictionary. “What I love about the eggbell is its ability to occupy such a liminal space as to disappear in a moment,” I’d say. We talked about this as a group: What does it mean that some things are more visible than others? How does visibility reflect the criteria by which we engage the world? And then, the minute the class was dismissed, I’d watch everyone put on coats, backpacks, stack chairs, turn—and in turning, I’d see the forgetting happen suddenly, the eggbell disappearing from thought and thus bumping against their shoulders or back or backpack, so weightless as to be unfelt, the small flakes of shell splintering off its base and falling to an ever-increasing pile on the floor. When I explained the situation to Lapthisophon it made him laugh. “That’s perfect,” he said. “Replace it if you have to.” In an artist’s talk he said he felt passive resistance was underrated. The fact that the eggbell survived this abuse for the three-month duration of the show, the fact that any poetry reading we had, or screening, or public event, caused staff members to guard the eggbell with often useless attempts to prevent it from colliding with visitors—as time went on, I projected more and more of my awareness onto that humble, Frankensteined object, inspiring more and more affection. I even started to love its slow destruction; I began to wait to try and catch the precise instant when it was forgotten, and then rooting for its endurance afterwards. How things slip in and out of consciousness, I thought, how I love their radical vulnerability. Stephen Lapthisophon, Notebook 1967-68: September-January 2015 (Dallas: n. p. [self-published], 2016), 80-81. Hereafter cited parenthetically as N.
 Charles Emmerson, 1913: In Search of the World before the Great War (New York: Public Affairs, 2013), 333.